There are few things more romantic than being whisked away to a beachfront hotel and spending a long weekend in your own little happy place. Romantics have long been drawn to Daytona Beach’s endless beauty, but the area offers more to lovebirds than just its pretty views. Along with the beach-y reprieve you would expect from a coastal destination visited by almost 10 million annually, there’s a quaint, authentic and surprisingly quiet side that couples love, too. Trying something new as a couple can be invigorating — something about getting the heart pumping and diving into adventure with the one you love is especially memorable. 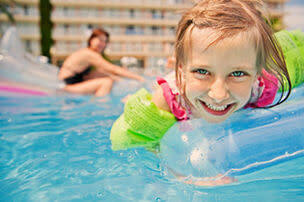 And in Daytona Beach, there are so many ways to expand your horizons and experience an unforgettable rush. - Tandem parasailing will leave you and your date flying on cloud nine! 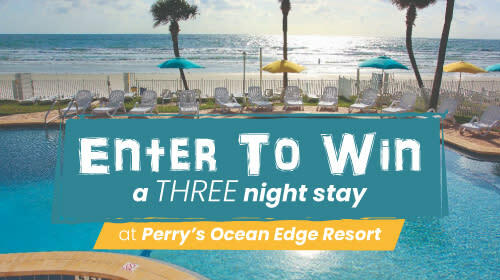 Soaring above the area’s ocean waters, you’ll be able to soak in top-notch views of Ponce Inlet Lighthouse, Daytona Beach, New Smyrna Beach, the Intracoastal Waterway and an array of wildlife. The parasail boats are U.S. Coast Guard-certified, so you’ll be in good hands as you reach a line extension of 600 feet, 800 feet, 1,000 feet or 1,200 feet — your choice! - Skydiving is one way to take your love to the next level. For those who are brave enough, a free fall from the sky is an entirely new way to see the area. And, you don’t have to have any previous experience to get in on the action. Tandem skydiving is a popular way for first-time jumpers to feel the thrill of a jump. Paired with an experienced instructor, you will jump from an aircraft that cruises at nearly 14,000 feet in the air. - The NASCAR Racing Experience is one of the best ways to experience the car-racing legacy of Daytona Beach! Get in the driver’s seat — or ride along with a professional racing instructor — and zip around the iconic Daytona International Speedway. You and your significant other won’t soon forget how it feels to be a part of the area’s rich racing history. 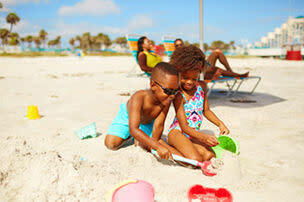 Daytona Beach has a mile-wide list of outdoor activities to enjoy. 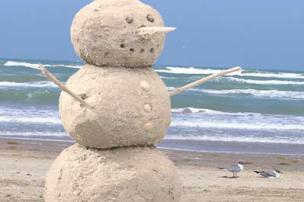 With mild temperatures year-round, the weather won’t likely limit outdoor fun, no matter what time of year it is. - Kayaking and paddleboarding one of the many waterways, inlets, creeks and rivers in the Daytona Beach area will give you and your special someone an up-close view of the area’s diverse ecosystems and wildlife. Many state parks offer canoe and kayak rentals on-site, making it easy and convenient for you to paddle off on an exciting excursion together. 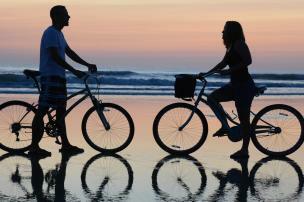 - Riding bicycles in Daytona Beach is a favorite activity of couples visiting the area because it allows for soaking up gorgeous scenery, spending time together and getting some exercise. Whether the two of you go for a ride underneath the Spanish-moss drapery of the Ormond Scenic Loop & Trail or out into the open along the 23 miles of hard-packed beaches, wonderful memories are waiting to be made. - Boat tours and manatee spotting are something of a local phenomenon, and a romantic activity for any couple in love. A river cruise is an ideal way to absorb the area’s natural beauty, spot a friendly sea cow and learn how the city took shape so many years ago. Sometimes a good, old-fashioned date night is just what the doctor ordered. File into Cinematique Theater like teenagers and cozy up at Daytona Beach’s only independent movie house, which serves beer, wine and snacks tableside. Rejuvenate the mind, body and spirit by enjoying a couples’ spa treatment at an oceanfront resort. Dance the night away or climb Ponce Inlet Lighthouse (Florida’s tallest!) to pop the big question or share a romantic wish. Head to one of Daytona Beach’s best beach bars that feature live music, or even step it up a notch with live entertainment at a renowned venue like the Peabody Auditorium. And if the two of you fancy a laugh, head to a stand-up comedy or improv show in the area. Ever heard your grandparents talk about going for a Sunday drive? It may seem outdated, but sometimes just cruising along with the windows down and seeing where the afternoon takes you is the perfect day date. Drive down famous A1A with the ocean breeze blowing through your hair, or explore the roads tucked back among the live oaks within the Tomoka State Park area. This route is a popular motorcycle ride during Bike Week in March and Biketoberfest® in October, but is tranquil and quiet most times of the year, with several opportunities to stop and gaze or walk the trails. Craving dinner with a view? 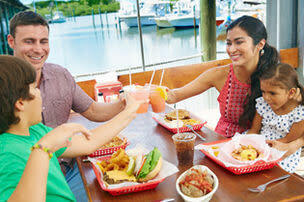 Daytona Beach has you covered with a number of romantic restaurants. - Grab a specialty cocktail at 31 Supper Club, the critically-acclaimed Ormond Beach restaurant that frequently tops “Best of” lists in Central Florida. With a speakeasy vibe and delectable artisan foods, 31 Supper Club is the ideal spot for a unique date night. - Dine at The Cellar for a romantic atmosphere and excellent service. This restaurant, located in a historic building, specializes in fine Italian dining. Reservations are recommended, so call ahead! - Top off the evening with ice cream at one of the local ice cream parlors. Satisfy your sugar craving with your sweetie by stopping by for a scoop of handmade ice cream, or grab one of the city’s legendary chocolate treats. Local romantics know there are so many more delightful dining spots in Daytona Beach, but these eateries are sure to create a few sparks. Spectacular sunsets are enjoyed from many riverfront restaurants, too. With the Atlantic Ocean coastline, Halifax River and Ponce Inlet all within easy reach, there is no shortage of places to create your own romantic backdrop on the water. Create a picnic basket with local foods and locally-made Angell & Phelps chocolates for a leisurely romantic stroll. Take a sunrise walk on the beach, or enjoy signature cocktails at either the Main Street or Sunglow Pier, kicking off your shoes to stroll along the beach at dusk. The stargazing is spectacular! For racing enthusiasts, there’s nothing more romantic than a Gatorade Victory Lane wedding at Daytona International Speedway. For others, it doesn’t get any better than a quiet spot on the beach at dusk. In fact, traipse down to the Ponce Inlet Jetty at that hour to catch the romantic vibe, and you’ll likely see a wedding photographer capturing the ambiance. The Casements and Ormond Memorial Art Museum and Gardens are also favorites among brides-to-be. If you’re soon to be a blushing bride, be sure to read more unique ideas for a beach destination wedding. 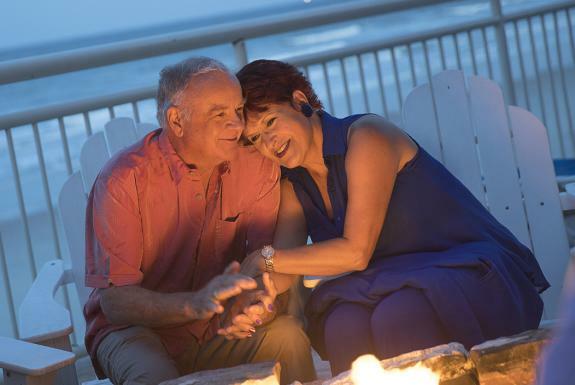 Whether you’re young or young at heart, the romantic side of Daytona Beach is sure to dazzle you with its charm. Plan your romantic weekend escape today!